In 2012, more than 114,000 Americans were diagnosed with kidney failure. That’s two and a half times the population of Jefferson City, Missouri. The United States Renal Data System (USRDS) makes it easy to track kidney failure geographically by breaking each region of the country into networks. In Network 11, where Missouri resides, 7,151 people were diagnosed with kidney failure in 2012. According to the United Network for Organ Sharing (UNOS), 77.1% of people waiting for an organ transplant in Missouri are waiting for a kidney. A year ago in Macon, MO, Bill Johnson felt dizzy and short of breath while roofing a house. He wasn’t sure what was happening, he just knew something felt wrong. Kidney failure is often silent. He had none of the leading indicators of kidney disease: no genetic or hereditary factors, no high blood pressure and no diabetes. But something was happening that he had never experienced before. A check-up later that week revealed abnormalities in his kidneys as well as high blood pressure. He was given 30 days to change his diet and try a new medication to lower his blood pressure, but to no avail. His nephrologist, June Watson, DO, diagnosed him with End Stage Renal Disease, commonly referred to as kidney failure, and the cause remains unknown. “It was all very rapid. One day I was hot and sweaty, roofing a house. The next day, I couldn’t even carry a stack of shingles,” Bill said. Kidney failure is not painful, and it won’t make you sick until it’s very advanced. Bill said Dr. Watson determined he would need dialysis, and eventually, a kidney transplant, in order to survive. He joined nearly 2,000 others on the Missouri transplant waiting list. In the U.S., more than 100,000 people are awaiting kidney transplants. Last year, only 17,104 kidney transplants took place—less than 20-percent of those in need. 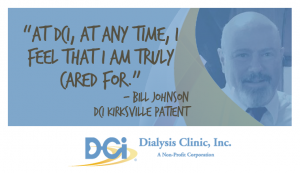 While he waits, he receives in-center dialysis three times a week at DCI Kirksville. Bill said that a family-oriented dialysis clinic is the most important factor when choosing a dialysis facility. He said DCI Kirksville has a sense of community, often laughing and sharing life together, providing peace in a time of confusion and transition. 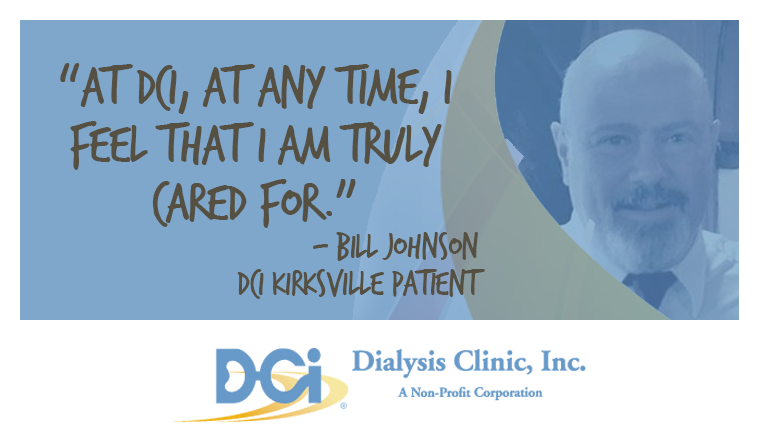 Since beginning dialysis, both Bill and his family have focused on learning how to live with kidney failure. Bill’s wife and family members who live near him help monitor his diet and medication. They even make sure there is always kidney-friendly food available at family gatherings. “26 million people have chronic kidney disease, which leads to kidney failure, and most people do not realize they have it. Periodically, patients like Bill will have to begin dialysis immediately after being seen by a nephrologist, due to the severity of the disease,” said Dr. Watson. Dr. Watson said people at risk for kidney disease should request routine labs, at least every year. They should also make sure their doctors test them for hypertension and diabetes, the two leading causes of kidney disease. Almost 40% of kidney failure patients in Missouri’s region are diabetic. Bill is just one of the 7,000+ people in the Missouri region with kidney failure. Kidney failure prevention starts with education. To learn more about kidney disease and the steps you can take to protect your kidneys, please visit www.dciinc.org.